For over half a century candy lovers have enjoyed our fruit flavored slices. Boston Fruit Slices began as part of the H.W. Powers Candy company in Boston. They were the first company to make and sell fruit slices in America. The product line was purchased by an employee and Boston Fruit Slices (the company) was born. We were located northeast of Boston in the town of Lawrence, MA for almost three decades. Today, Boston Fruit Slices are still handmade in small batches, and packed in our North Carolina facility in the same traditional manner we did 70 years ago. Using only the finest ingredients and flavors, these jelly fruit slices closely resemble actual fruit pieces in size, taste and color. Containing no fat, cholesterol or gluten, Boston Fruit Slices are certified Kosher and Kosher for Passover. Our new facility and all our products are completely allergen free! 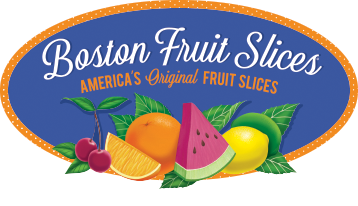 Boston Fruit Slices are available in a variety of pack sizes, ranging from bulk, to individually wrapped pieces to seasonal gift boxes.